A McDonald's employee who blogged about his Kaitaia workplace caused concern with the "menacing" tone of his blogs, a lawyer for the fast food restaurant says. Blogger Michael Davis last week said he left McDonald's because it "just got too political". McDonald's said he was sacked. Mr Davis agreed to remove his blog shortly after the Employment Relations Authority (ERA) became involved, ruling he refrain from making written statements or posting any information on digital media about McDonald's or its staff. In what was thought to be a legal first, Kaitaia McDonald's owner Justin Stonelake had initially applied to the ERA for an ex parte injunction to remove the blog. 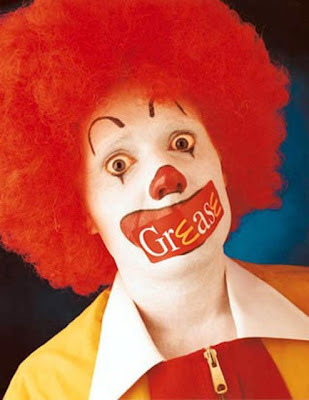 This week McDonald's said that the injunction was not simply an attempt to gag Mr Davis. His blog had been threatening, demeaning and offensive to McDonald's and its staff, barrister Eska Hartdegen said. "One page said on top: `War time, kill them all and let God sort them out."' Mr Davis said his comments were quotes from a game and were taken out of context by McDonald's. "They didn't want to listen or understand what I was trying to explain." The blog also contained criticisms over some of the restaurant's work practices, he said. Poor Ronald doesn’t like it when kids talk out of school, amazing isn’t it, a website threatening to kill a Politician wasn’t taken down, but one that talks bad of McDonalds gets the full weight of the ERA and injunctions, nice to see corporate power in action, I’d suggest to any kids working for Ronald to post insider blogs anonymously so they can’t catch you.